Pitted Green Olives, fresh Basil Pesto, White Balsamic Vinegar, fresh Garlic and Extra Virgin Olive Oil. Amazing smeared on toasted Ciabatta with Cream Cheese and chopped Chives. Pitted Kalamata Olives, Basil Pesto & Extra Virgin Olive Oil. Scrummy with a Lamb Roast & Yorkshire Pudding. 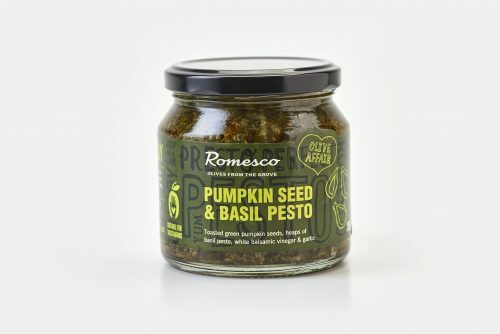 Green Pumpkin seeds, Basil Pesto, Garlic, white Balsamic Vinegar and Extra Virgin Olive Oil. Amazing on toasted Ciabatta with Ricotta and chopped Chives. Roasted Cashew Nuts, Mini Bell Pepper, Balsamic Vinegar & Extra Virgin Olive Oil. Lovely with Chicken and Prawns. Smoked sun-dried Tomato, Balsamic & Extra Virgin Olive Oil. Lovely on Bruschetta with Parmesan Cheese. Sun-dried Tomato, Balsamic & Extra Virgin Olive Oil. Seriously good mixed into Pasta with a dollop of Creme Fraiche.